If you have never visited Asheville, North Carolina, you might want to plan that trip. Whenever you can find time to drive through idyllic mountains to an iconic American town. Any season in Asheville will be a tourist treat. It’s small, hilly, packed with wonderful stores and great, great food. You may, for example, encounter a long line outside a building that emits perfect biscuit aroma. That would be Biscuit Head, already an institution after just three years of record setting performance. 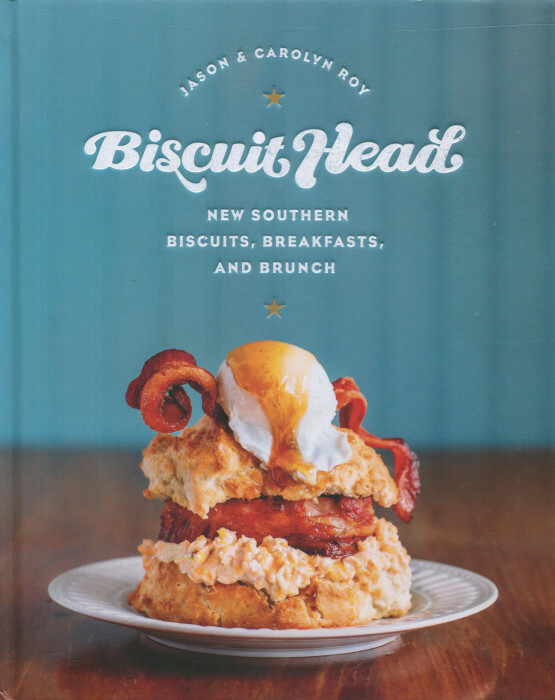 And now, from Biscuit Head founders Carolyn and Jason Roy, we have the cookbook. Biscuit Head is restaurant devoted to Southern cuisine. It’s far more than a mere biscuit shop, though it is biscuit-centric. Biscuit Head the cookbook is unlike the other biscuit cookbook you may have seen, for it is not filled with dozens of biscuit recipes. No, there are just a few biscuits here with the emphasis instead on how to use them: putting things on or in your biscuits, dishes to serve on the side, egg ideas for perfect pairing, and even sweet additions to pair with your biscuit. The trademark biscuit, their Classic Cathead Biscuit, is the centerpiece of the restaurant and the cookbook. It’s right there on the book cover, in a stuffed format with egg and bacon. Not exactly the version you get at that place with the golden arches, and surely far, far better. There are some biscuit alternatives, like the Roasted Corn and Jalapeno Biscuit. Yes, is a Mac ‘n’ Cheese recipe here and a fabulously colorful Beet and Basil treat. Surely, surely, you cannot pass on a book that offers up both Red Eye and Chocolate gravies. That has to be a unique combination, which is fitting because Biscuit Head is a unique and richly loved Southern institution. If you love biscuits, you want to get some White Lilly flour, of course, and this magnificent biscuit cookbook. You’ll enjoy every crumb. Every one. Oh, that Classic Cathead Biscuit? I'm posting the recipe now. And, yes, we made them and we ate them and we loved them. Every one of them.